The last lingering weeks of warm temperatures are the perfect time for swimming, picnics … and taking care of your roof. Huh? Yes, along with say-goodbye-to-summer fun, this is the season to take care of your roof before potential problems are covered up by snow, and cold, icy weather makes roof repair more complicated and dangerous. 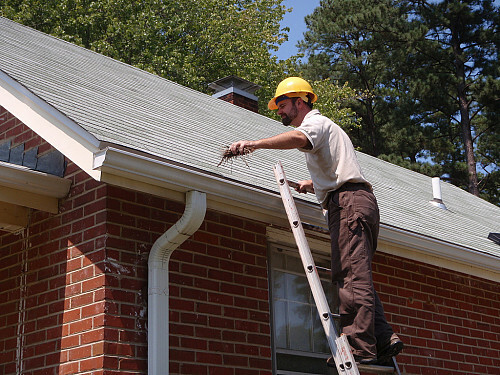 Here’s what you must know to ensure your roof is in great shape. Gutters perform the important task of directing water off your roof and onto the ground, safely away from your home’s foundation. They tend to collect all kinds of “goodies,” though, and by summer’s end, may be full of twigs, pine needles, seedpods, and abandoned bird’s nests. This debris will block water flow unless it is cleared out. After fishing large items out of the gutters by hand, use the trowel or brush to remove sludge. The last step of your gutter cleaning is a spritz with the hose. To protect against leaf clogs when autumn comes, consider installation of gutter guards. Next, inspect the gutter cleaning gunk in your bucket before you toss it, to see whether it contains roofing material, such as granules or pieces of broken shingles. Look inside your home, too, for signs of roof leaks like a stained attic ceiling, bubbling paint, or actual drips. Any of these is a warning that you may need expert roof repair. What, you may ask, does tree trimming have to do with roof maintenance? Well, spring and summer are the seasons of most abundant growth for your trees just as they are for smaller plants. But while healthy mature trees will add to the beauty of your property, if they happen to be located close to the house, overhanging branches may scrape your roof and fallen foliage or fruit can clog your gutters. Prevent potential roof damage with careful tree trimming. Summer rains also stimulate other growth that could be hazardous to your roof. After a shower, moss may sprout in the spaces between your roof shingles, and proceed to soak up as much water as possible. When this moisture penetrates the shingles and roof underlayment, it eventually damages the roof sheathing underneath, destroying your roof’s structural integrity. That’s why prompt moss removal is essential; in fact, your insurance provider might demand it. To avoid using environmentally harmful chemicals, have the roof brushed (“broomed”) as soon as possible after the moss appears, then install copper or zinc strips on your roof peak to prevent its return. Mold and algae enjoy humid summers, too. If these unwelcome guests have taken up residence on your roof, you’ll need a good roof cleaning before they do permanent damage. Whether to utilize a pressure washer for roof cleaning is a hotly debated topic. It’s true a pressure washer will give you an impressively clean roof. However, when used with the wrong tip or at too close a range, this power tool may well “clean off” the granules that protect your shingles from the sun. An alternative roof cleaning treatment is spraying with an eco-friendly cleaning compound. As with moss, installation of a copper or zinc strip atop your roof offers excellent natural prevention; these metals contain minerals that inhibit moss, mold, and algae growth.